Choose from a fabulous collection of high quality aluminium wood look venetian blinds and bring the look of wood to the windows of your home. Manufactured using only high quality components throughout, they will look great and operate smoothly for many years. They are ideally suited to any kitchen, bathroom or lounge window and create a wonderfully natural look around the sides of a conservatory. 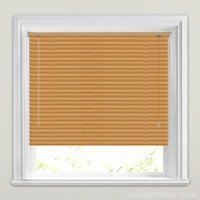 From dark wood to light wood our stylish faux wood effect venetian blinds come in beautiful choice of stains and styles allowing you to find the ideal wood colour to compliment the furnishings and colour scheme of your home. Perfect fit blinds, as expected - lovely!